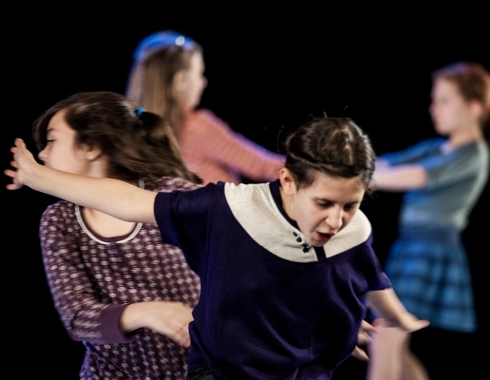 To spherical, electric sounds, a cast of 44 performers from Hanover, between the ages of seven and seventy-seven, take the stage by storm.They run, leap and pose; stretch themselves, approach one another and then scatter in all directions. Separately rehearsed movements become collective choreographies. Fragile images emerge and dissolve, to be recreated just a few moments later. 44 strangers come together for 61 minutes to show us who they are, and who they could be. 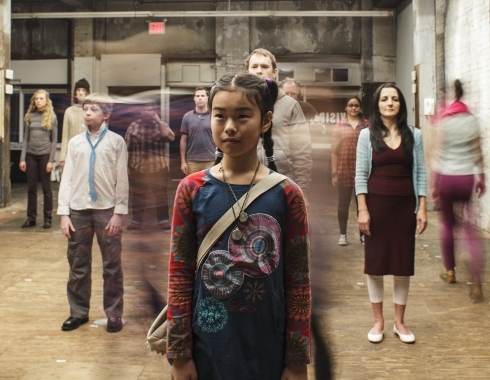 Part theatre, part dance, part group hallucination – vivid human assembly on an epic scale. The subject is us; the time is now. The New York Times referred to the New York premiere as one of the best shows of 2014. Last year 600 HIGHWAYMEN also received the renowned Obie Award. Founded in 2009 by Abigail Browde and Michael Silverstone, 600 HIGHWAYMEN has quickly become one of the most promising contemporary theater companies in New York. 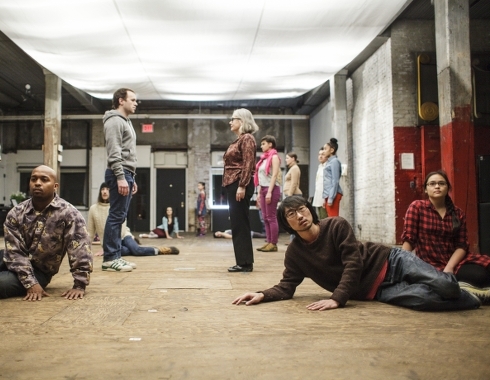 Since the post-World War II decades, downtown Manhattan and more recently Brooklyn, have become fertile sites of theater and dance experimentation. Starting in the 1960s collectives such as the Performance Group, the Living Theater, Judson Dance Theater, Grand Union, Bread and Puppet, the Open Theater, the Play-House of the Ridiculous and the Ontological-Hysteric Theater established a vibrant experimental performance scene in the city. The influence of these artists can be seen in the second generation of theater makers that gained wider prominence in the 1980s and 1990s including Mabou Mines, New York City Players, the Wooster Group, Elevator Repair Service, Radiohole, Big Dance Theater and the Builders Association, all of which remain highly active today. Within this historical context 600 HIGHWAYMEN emerges as a third generation of 21st century avant-garde theater companies who nurtured from and continue to build on the city’s well-established experimental tradition. 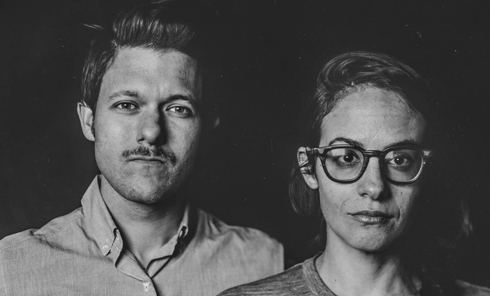 Fellow members of this latest generation include the Nature Theater of Oklahoma, Big Art Group, Young Jean Lee's Theater Company and the Civilians, to name just a few. For 600 HIGHWAYMEN the influence of this rich urban history is not only geographic but also educational since both Browde and Silverstone trained at New York University’s Department of Drama, which has among its faculty directors, playwrights and actors who are part of the city’s long-standing experimental theater community. It is therefore important to underscore how a vibrant artistic community that has been able to sustain itself across generations, such as New York’s experimental performance scene, produces fertile conditions for the emergence of groups with the conceptual rigor and creative vision of 600 HIGHWAYMEN. While this latest generation of theater artists continue to challenge theatrical conventions in various ways, from Young Jean Lee's dissection of American notions of identity to the Big Art Group’s sophisticated use of multimedia design, there is a particular combination of features that distinguishes 600 HIGHWAYMEN from other groups: first, their collaboration with non-professional actors as performers, and secondly, their use of minimal staging as a way to underscore the rich natural presence of their performers. Pushed to the limit, these qualities produce the heightened simplicity that is at the core of THE RECORD and EMPLOYEE OF THE YEAR. In both performances the ordinary is made extraordinary and what at first seems quite simple gains a rich complexity that demonstrates a special kind of virtuosity. I say special because unlike ballet, opera or classical drama this virtuosity has nothing to do with the perfect execution of a grand jeté, an aria or a soliloquy. It is a much more elemental form of virtuosity since it plays with the fundamental conceit of all theater: the simple act of being on stage. In playing with this most essential of theatrical conventions, one that hinges on the brief contract between the ones who watch and the ones who allow themselves to be watched, 600 HIGHWAYMEN deliver minimalist performances that blur the line between the beautiful and the banal. It is in their sophisticated troubling of these categories, in their capacity to reveal the magnificence of the mundane that THE RECORD and EMPLOYEE OF THE YEAR achieve a different kind of virtuosity. I dwell on the concept of virtuosity because in inviting forty-five diverse members of the local community to perform in THE RECORD or five young girls in the case of EMPLOYEE OF THE YEAR, these pieces immediately challenge notions of expertise, technique and training that we tend to associate with virtuosic performances. THE RECORD and EMPLOYEE OF THE YEAR invite us to think of virtuosity otherwise, as a horizontal rather than hierarchical relationship with those on stage. This kind of virtuosity is not about a transcendental beauty out there on the proscenium beyond our reach. Rather it is a much more immanent form of beauty that resides in the enchantment of the everyday. In this way these pieces echo the work of 20th century artists such as Kazimir Malevich, Marcel Duchamp, John Cage and Yvonne Rainer, among many others, whose minimalist works inaugurate an invitation to think of what anthropologist Michael Taussig calls “the mastery of non-mastery.” A mastery that seeks to empty out form, reducing the artistic gesture to its bare necessity so as to make porous the line between art and life. 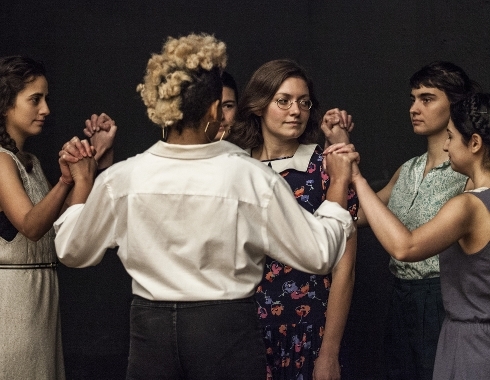 Browde and Silverstone’s resistance to move beyond minimalism allows for the mundane to flourish: for five girls to reflect on their mortality and for a group of strangers to suddenly create a sense of intimacy on stage. The impulse to invite everyday folk to perform so as to celebrate their everydayness, allows Browde and Silverstone to remind us of the inherent theatricality of social life. It is therefore not incidental that some critics have highlighted the life-like quality of these performances. In a review of THE RECORD Charles Isherwood remarks that the piece instills “a shivery sense of reverence for the communal experience not just of theater, but of life itself.” Molly Grogan writes how the piece “explores the nature of being human, of being at all, moving and interacting with hundreds of others just like, but not quite like, us.” In this work life and being are made manifest through the idiosyncratic physiques, faces, gazes, gestures, strides, voices and clothes of the performers on stage. In difference, diversity and variety the human asserts itself not as a generic category but as an inevitable specificity: just like, but not quite like, us. By eschewing elaborate set designs and keeping their lighting cues to a bare minimum, 600 HIGHWAYMEN focus on the performer behind the performance as central to the theatrical event: gesture, time, space, movement and text become the palette of their work. 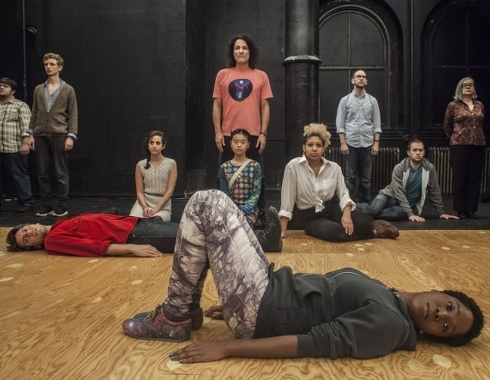 In this aspect their performances are as much dance as they are theater, which illustrates how the experimental dance and theater scenes in New York overlap with one another. The care and simplicity of 600 HIGHWAYMEN’s mise-en-scène generates a formalism, which augments the rich humanity of their performers. It is also in this sense, following Niccolò Machiavelli’s notion of virtù that we can speak of the virtuosity of their performers. Derived from Latin virtus meaning excellence, virtù for Machiavelli did not necessarily mean Christian virtues but rather the qualities inherent in a person that manifested themselves as a forceful vitality. It is precisely this kind of vitality that pervades THE RECORD and EMPLOYEE OF THE YEAR. Through them we get a transient yet deliberate glimpse of the attributes, qualities and dispositions of each and every one of the performers. We are given the privilege to dwell on the virtuosity of their presence as distinct human beings and in so doing are invited to reflect on our own.